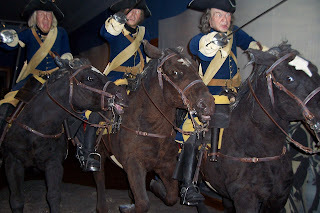 Fantastic trio of Swedish cavalary from the period of Karl XII at the Swedish Armee Museum at Stockholm. Notice the small size of the horses and just how close they are to each other to help with the delivery of the famous Swedish cavalry charge. I plan to do the Great Northern War later this year when I get through this pile of lead for the Deluge period. Musketeer Miniatures are bringing out some fantastic figures for the period and these combined with the great War of the Spanish Succession range from Front Rank will fulfill all my needs, except for Ottomans and Poles of course.